Porto is a fabulous destination all year long and it’s very easy to reach from anywhere in Europe. 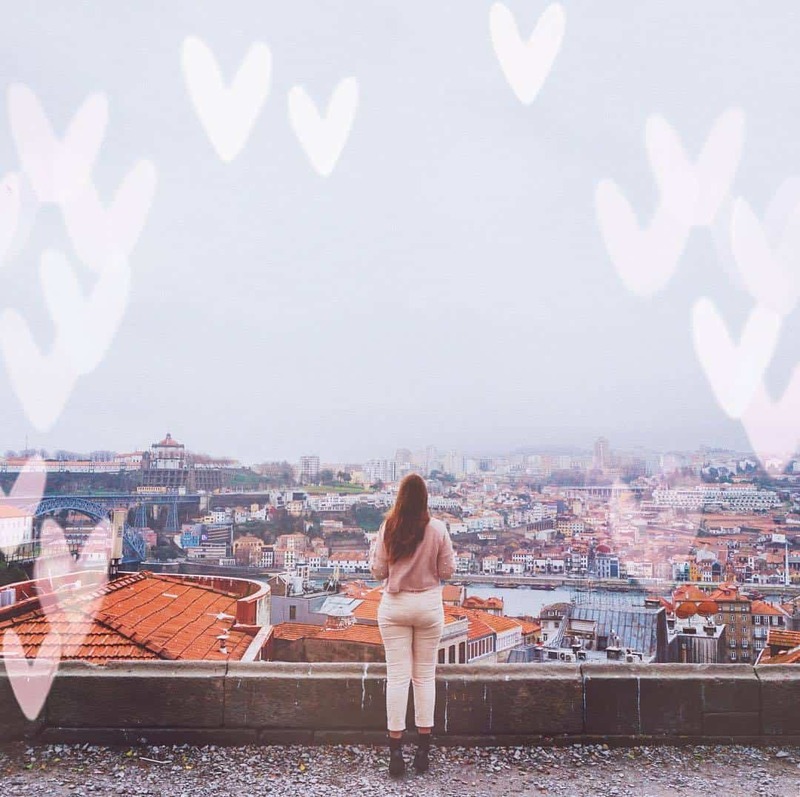 A few weeks ago, we spent a weekend in Porto and would love to share with you our thoughts and itinerary as well as the most Instagrammable places of Porto. 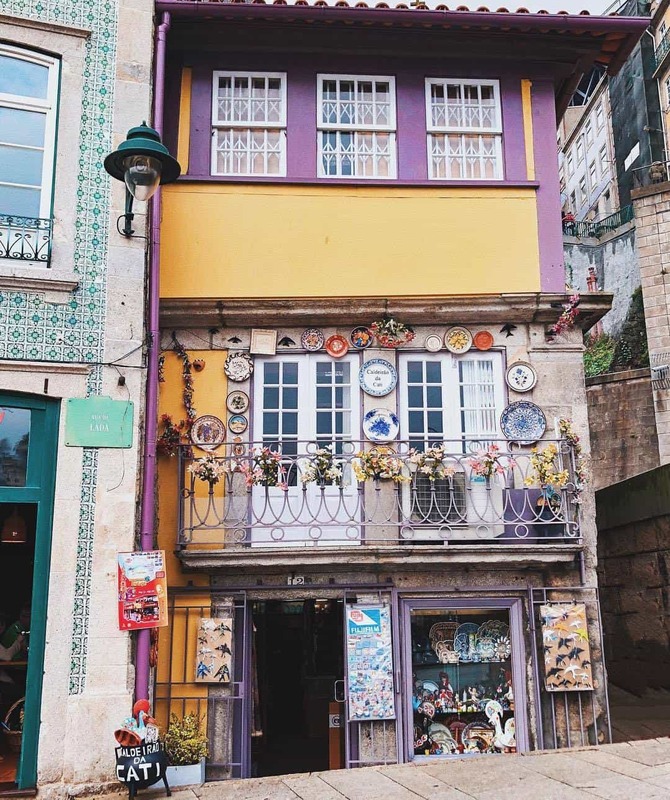 While Portugal is definitely the all-year-round destination, a visit to Porto in December might be quite unpredictable. You could be lucky and have a very warm weather, but you could also catch a storm. 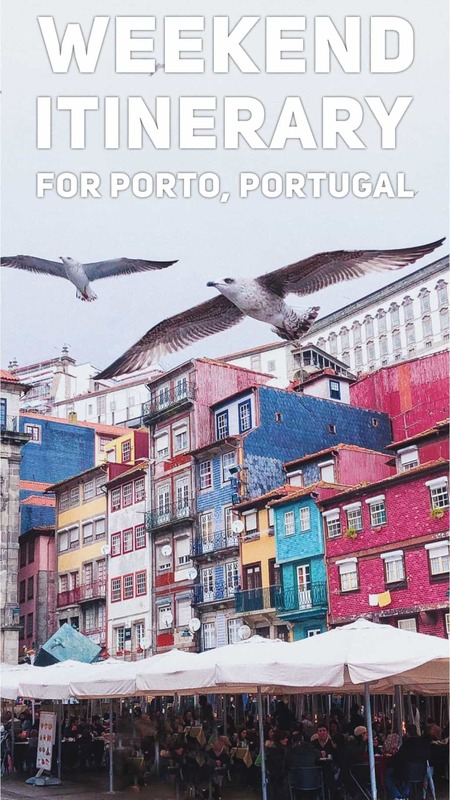 Nonetheless, Porto is way warmer than London in any case, so if you’re based in the UK, you won’t regret this small trip to Portugal. We only had 1.5 days in Porto (weekend in Porto): we arrived early in Saturday and were supposed to leave around 3 pm on Sunday, but our flight was cancelled, so we actually left around 8 pm. Even though 2 days in Porto aren’t that much, we actually managed to see quite a lot of the city. When you arrive to the Porto international airport, you can either take a bus or a metro (tram) that brings you to the city centre. The price is cheap compared to the major European cities: 2 return tickets will cost less than 8€. The journey takes about 30-40 minutes. Since we only could check in to our apartment at 3 pm, we decided to find a locker and leave our bags. That wasn’t so complicated: there are serviced lockers at the main train station of Porto. The station is in the heart of Porto, which is really convenient. Actually, the station itself is very impressive – inside it’s decorated with fabulous Portuguese tiles and you’ll see plenty of tourists wandering inside and taking photos of the railway station. We were very hungry, so we headed to the best-rated restaurant of Porto – Tapabento. The restaurant is so popular, that there is usually a queue outside before the restaurant even opens at 12 pm. The most secure way to get to the restaurant is actually to call them in advance and make a reservation. In the beginning, I was a bit sceptical about the place, since the prices were high to Portuguese standards (a starter was around €11-14 and a main was around €22-30), but all the dishes were huge and could easily feed two people. So one starter and one main would be perfectly fine for two people. The food quality and taste were exquisite, so definitely make a space for this place in your itinerary. Later on, we headed to the Douro river embankment. Such a pity, the sky was full of clouds and the colourful city of Porto seemed gloomy and sad. Nonetheless, even with that weather, the city was beautiful! 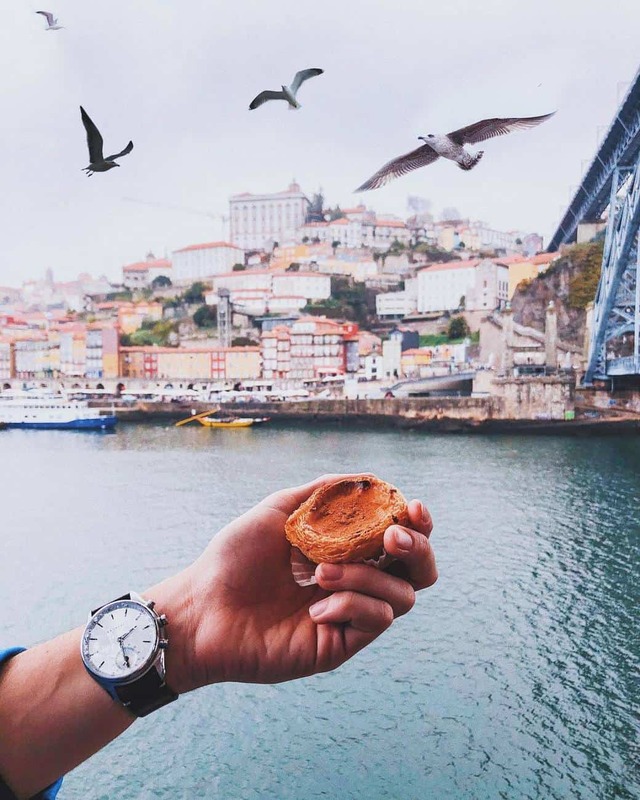 We walked the promenade all the way to the bridge and bought the most delicious and fresh pastel de nata in Porto. Pastel de nata is a traditional Portuguese pastry and it’s really delicious. You won’t have any problems finding it – they sell it in every single cafe and restaurant, however, the best I’ve tried in Porto was just in front of this bridge. We crossed the bridge to the other part of Porto and decided to stop for a glass of port in one of the tiny restaurants. The southern part of Porto (south of the river Douro) is the part, where all the wineries are located. In some of the wineries, you can have a tour, in the others, you can just buy a bottle of port. We were interested in visiting one of the wineries, however, we couldn’t buy a bottle of port, as we were travelling with hand luggage only. If you’re just like us, don’t worry – there is a huge variety of port in the Porto airport. There is a very scenic route through most of the wineries – just take the road and climb the hill. In the evening, after checking in into the apartment, which actually had the perfect location – Mouzinho street, 3 minutes walking from the train station (it was a great catch – an amazing apartment for just £35 a night) – definitely check it out, we decided to go for a dinner. We chose one of the best-rated places on Foursquare, but unfortunately, it wasn’t as good as Tapabento. The food was very average, but the highlight of the dinner was the cheesecake in a flower pot. Delicious! 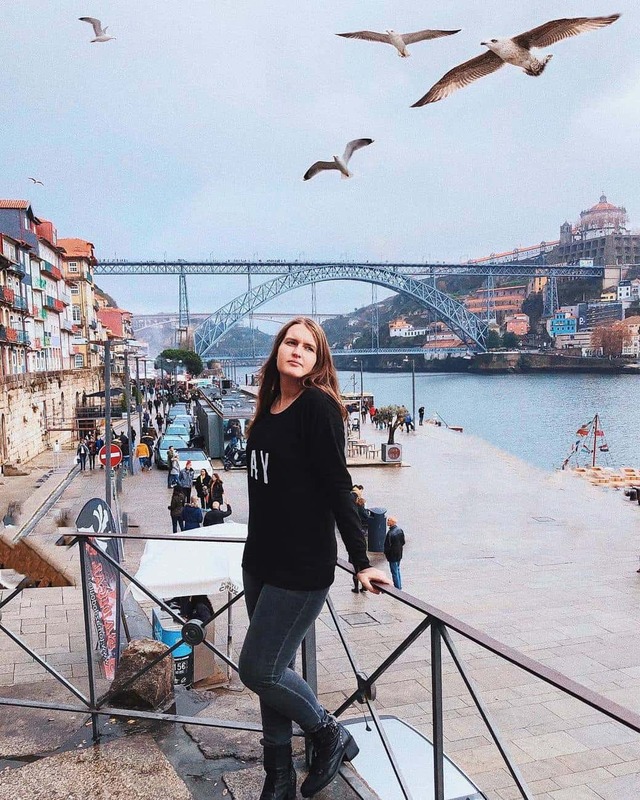 In the morning, we checked out, grabbed a pastel de nata and a coffee in a local cafeteria and headed to the Bolsa Palace, one of the most beautiful palaces of Porto. There we had a sad surprise – you could only visit the palace with the tour that goes every hour. However, most of the tours for the day were sold out, so we couldn’t actually visit the palace at all. In case you want to visit Bolsa palace, you should definitely book a tour in advance, especially during the high season! Not being able to visit Bolsa palace, we climbed the street heading to Mirador, a panoramic lot, from where you can see the entire Porto. Later on, we went to the Livraria Lello – the famous bookshop that is portrayed on all the photos from Porto. Not only it’s is a bookshop, where you pay to buy books, but you also have to pay 4€ to actually get inside. It got very popular when it was revealed that it inspired Joanne Rowling and was actually featured in Harry Potter. 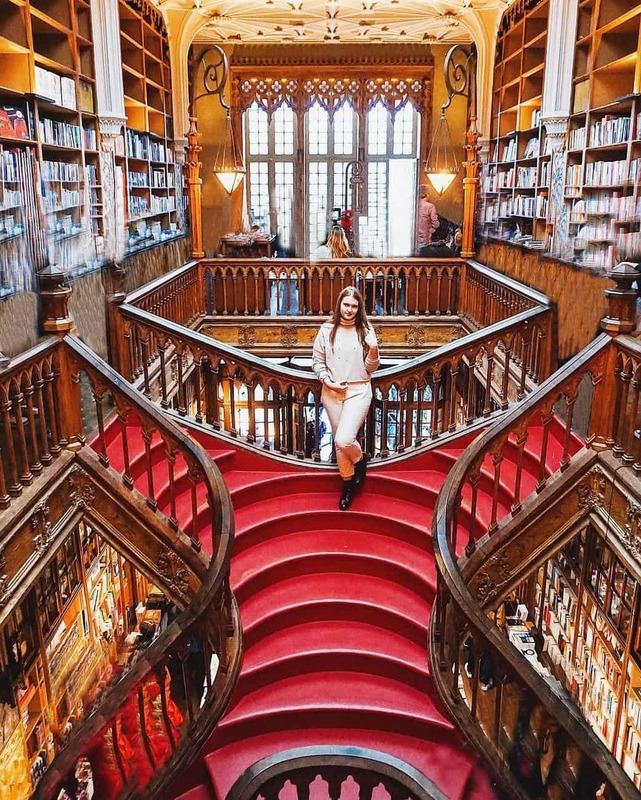 We aren’t crazy fans of Harry Potter, but we wanted to see the place, as this bookshop claims to be the most beautiful bookshop in the world. Well, it is undoubtedly very impressive and beautiful, but you need to stay in the queue for one hour and when you actually get inside, the place will be so full, that you wouldn’t be able to walk or take photos. We took some photos, but I actually cut out most of the people, but as you can see, that ruined the photo. After getting out of that madness, we went to the next spot on our list – the Church decorated with incredible tiled from the outside. The last spot on our list was the colourful wall in front of the restraint, which was really photogenic. As we lost a lot of time queuing for the Livraria Lello, we couldn’t fit other remarkable places in our itinerary, as we had to go to the airport. At the airport, we actually found out, that out Ryanair flight to London was cancelled. But well, that’s a different story (which we will describe in one of the next posts, so you know what to do in case your flight is cancelled). Sweater, a light waterproof jacket, leather jacket, trainers (you’ll have to climb a lot and the boots aren’t comfortable for that). 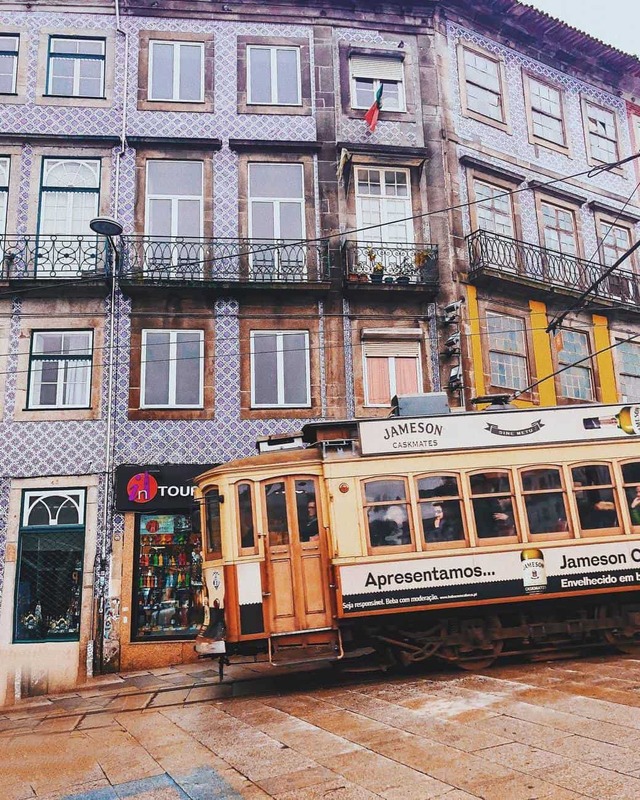 Liked this post about the weekend in Porto? Porto during the off-season is also fun. Share this post on social media if you found it useful! We write about weekend trips a lot: check some of our recent posts, such as a weekend in Aarhus and weekend in Toulouse, France.